For the main course in my Thanksgiving Week menu, I decided to share a recipe for a vegetarian dish. As I mentioned in my first post of this series, I don’t know the first thing about roasting a turkey and I don’t think most people need a new turkey recipe anyway. What I think people do need inspiration for is a main dish to satisfy the vegetarians at the table, who may not be too fond about the idea of tofurkey (at least the vegetarians I know aren’t)! 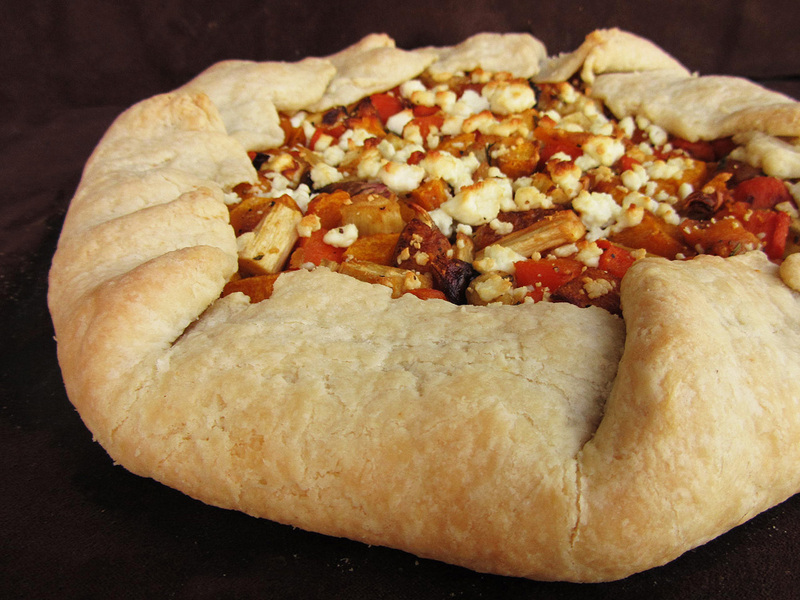 I’ve been wanting to make a galette for a while now, so I thought this would be the perfect vegetarian main dish to share for Thanksgiving Week. I first chose a recipe from Eating Well that had a much healthier crust than most other recipes, with whole wheat flour and only a bit of olive oil instead of butter or cream. Since I would be eating the whole test version myself, I thought this was a good decision. Unfortunately, the dough didn’t agree with me. Even after adding way more water and oil than the recipe called for, the dough was a big crumbly mess. I still wrapped it up and put it in the fridge, hoping that it would magically transform into a workable dough by the morning. Well, no such luck. I spent what felt like hours trying to roll out the dough the next day and when my arms could barely even lift the rolling pin anymore and my dough was in a million pieces, I gave up. I then decided to go with a trusted baking source, even if it meant an unhealthy dough. Martha Stewart’s dough recipe called for a whole cup of butter, which scared me a little bit, but I convinced myself that if it meant I would have a manageable dough, it was worth the splurge. Besides, I’d already burned off about a thousand calories trying to roll out the other dough earlier! I whipped up the new dough and it was so soft and easy to work with that I wanted to kiss it. Instead, I covered it with roasted vegetables and goat cheese and baked it into the most delicious dinner I’ve had in a while. 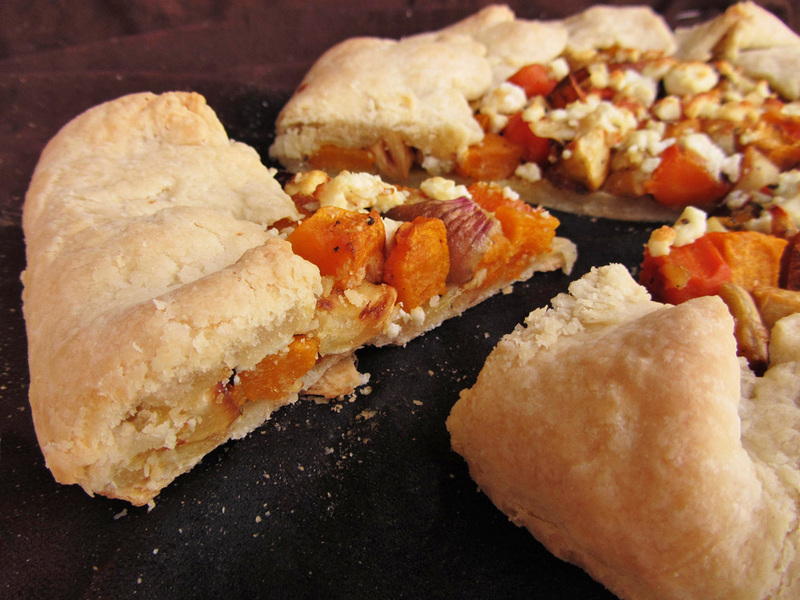 You really can’t go wrong with a buttery, flaky pie dough, sweet roasted vegetables, and creamy baked goat cheese. This galette is definitely something the vegetarians at your Thanksgiving meal will appreciate, and the meat-eaters will be jealous of. Even if you don’t have any vegetarians to serve, this galette would still make a lovely addition to the table, either as a side dish or an appetizer if cut into smaller slices. Or, you could just make this on a random weeknight to eat all to yourself so that I don’t have to feel as guilty about doing it too! If you want a healthier idea for a vegetarian main course, check out the Day 6 recipe over at Vanilla & Spice for butternut squash and apple quinoa. And if you still need more inspiration, then check out the links at the end of this post! Pulse flour and salt briefly in a food processor until combined. Add butter and pulse about 10 seconds, until mixture resembles coarse crumbs with some larger pieces remaining. Add 1/4 cup of ice water and pulse until mixture begins to hold together. If it’s too dry, add up to 1/4 cup more ice water until dough holds (but is not wet or sticky). Remove dough from food processor and shape into a disc. Wrap in plastic wrap and refrigerate until firm, about 1 hour or overnight. Chop carrots, parsnips, and squash into ½” uniform pieces. Combine vegetables (carrots, parsnips, squash, shallots) with 1.5 tablespoons olive oil, rosemary, salt, and pepper in a large bowl and toss to coat. Spread the vegetables on the baking sheet. Cut the tips off one end of the head of garlic and drizzle the exposed cloves with a teaspoon of oil. Wrap garlic in foil and place on the baking sheet with the vegetables. Roast vegetables and garlic until tender (they don’t have to be completely soft because they will go in the oven again later), about 20-30 minutes. The garlic may need an additional 10-15 minutes in the oven on its own. Transfer the vegetables to a large bowl. Unwrap the garlic and let cool slightly. Squeeze out the garlic cloves into a small bowl and mash with 1 teaspoon olive oil. Add the mashed garlic to the vegetables and toss to coat. Once dough has chilled, roll it out on a floured surface or pastry mat into a 15” circle, about 1/4” thick. Line a baking sheet with parchment paper and transfer the dough onto the sheet. 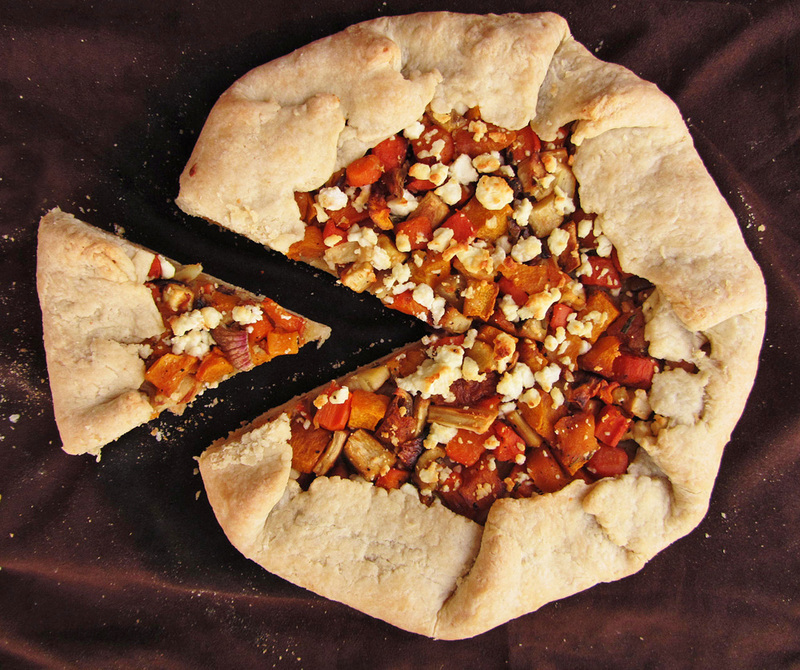 Arrange the roasted vegetables on top of the dough, leaving a 2-inch border around the edges. Sprinkle goat cheese over the vegetables. Fold the border of the dough up and over the filling to form a rim, pleating as you go. Bake until crust is golden brown, about 50-60 minutes. Serve warm. I've always wanted to try a galette, and this one was so good! I'm glad you found a dough that worked out so well...the vegetables were good on their own, but eating them on top of a rich, buttery crust was even better! The crust looks amazing! I use a similar recipe for my pie crusts. this recipe is such a happy reminder that fall is here! 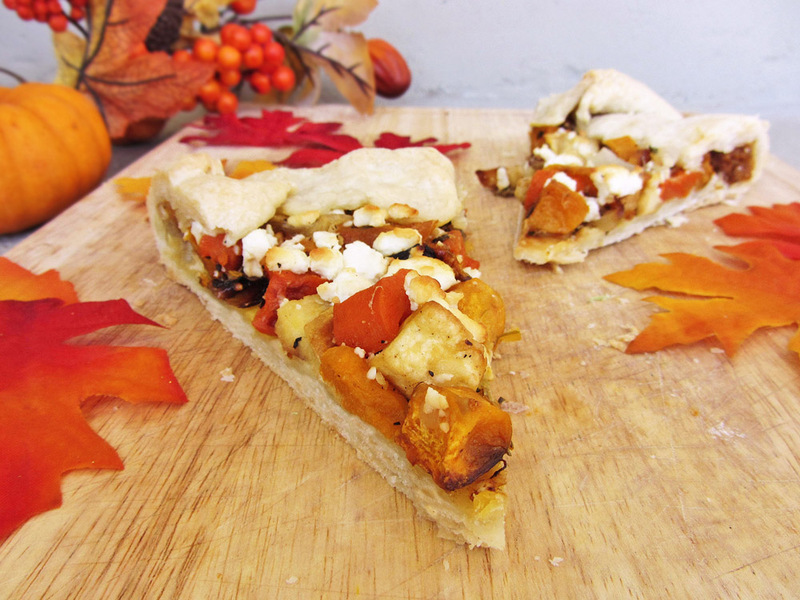 i love fall foods, and this galette is so colorful and beautiful! Thanks! I loved the fall colours of this too - you could even add some beets for a really pretty punch of colour! This looks absolutely perfect for Fall! I love this idea, definitely going to try it out in the coming months. Thanks! There are lots of different variations you could do with the vegetables or cheese depending on what you have on hand but I thought the squash, carrots, and parsnips were a great fall combination. Hope you enjoy it! Should the shallots should be cooked with the other vegetables? It doesn't specify in the directions. *I used 1 cup whole wheat flour with 1.5 cup white flour, and it turned out great. Sorry I didn't see your comment on time, but yes the shallots get roasted with the vegetables - When I said to roast all the vegetables that included the shallots, which are a vegetable, but I will change the directions to make that more clear, thanks! Glad to hear it worked well using some whole wheat flour too!